Driving down the road to Craig Reynolds’ agave roast out this past Sunday. I passed groves of walnuts, olives, and grapes all powered by a chunk of the big irrigation canal that makes California such an agricultural powerhouse. All of that along with the freeway that I was speeding down are examples of what makes (at least made, see recent debates about America’s crumbling infrastructure) the United States such an economic powerhouse. In contrast, when you go to Oaxaca the most basic things can’t be depended on, least of all roads and irrigation. And yet, here I was driving up a dirt driveway that wouldn’t have been to of place in Oaxaca to an agave roast that relied on native Oaxaca talent to make it happen. No matter how far you travel some things are fundamental, and especially so in the agave spirits universe where know how is the critical component, the rest is just dressing. That’s just one of the major contrasts to the sight of the the roasting pit that Craig and his bi-national crew of Efrain Nolasco from Benesin Mezcal in Oaxaca, Lance Winters from St. George Spirits, Doug Richardson from Drylands Farming, and many more had assembled on a ranch north of Sacramento because this is just the latest stage in a burgeoning effort to create an agave spirits industry in California. Craig Reynolds has been gnawing on the idea of how agave fits into California for some time. He worked in Sacramento as a legislative staffer who also started CA Agave Ventures to import and distribute Dos Volcanes, the agave spirit that he developed in Colima in 2014. Dos Volcanes is Not a Tequila in Name Only (NATINO!) because it’s made from blue agave grown outside of the appellation of tequila, just over the border in Colima. It tastes just like a tequila and Craig even structured it like a tequila with blanco, reposado, and añejo expressions. He planted the agaves in 2006, had them harvested in 2014, and worked with a tequila distillery in Jalisco to create Dos Volcanes. Agave roast organizer Craig Reynolds behind the bar at the roast. 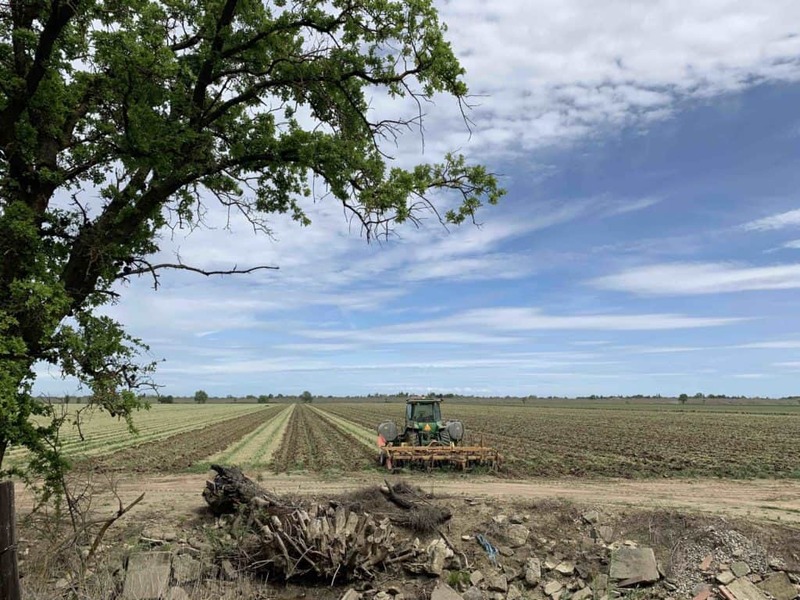 He took that experience and planted agaves in Yolo County in 2014 and started working on the idea of a California agave spirit. 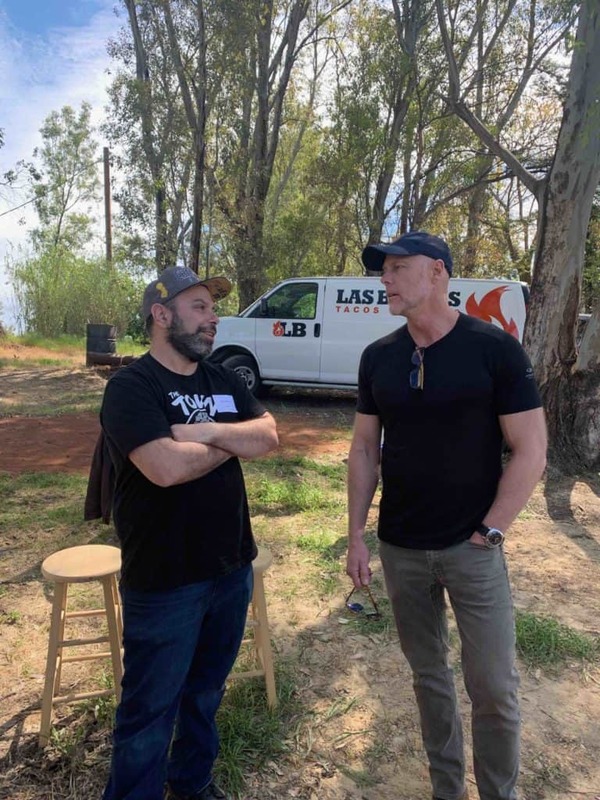 Once he met Mark Carlston who farmed agave in Riverside County and makes Crotalo Tequila and connected with St. George Spirits’ Lance Winters they set up their first project in 2015. 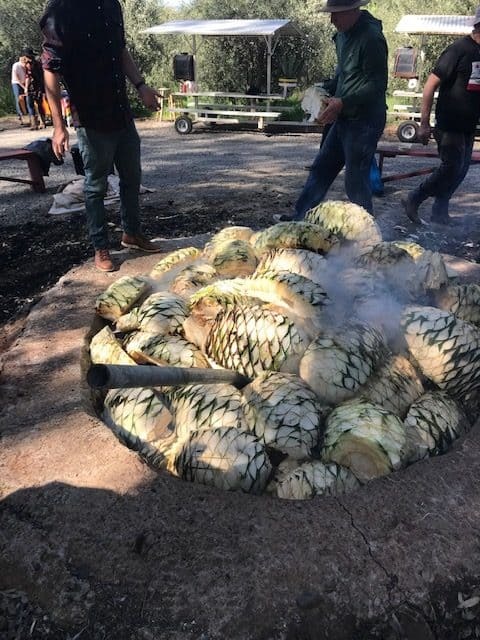 They brought blue agave from Mark’s property in Riverside County, roasted them in the same pit we were using Sunday, and then Lance led the rest of the process at St. George’s Alameda distilling facility. While the project was successful, it didn’t produce enough bottles to merit a commercial release. Lance had even tried to make an agave spirit with Mexican agave way back in 2008 on a project called Agave Azul which was quite a trial. 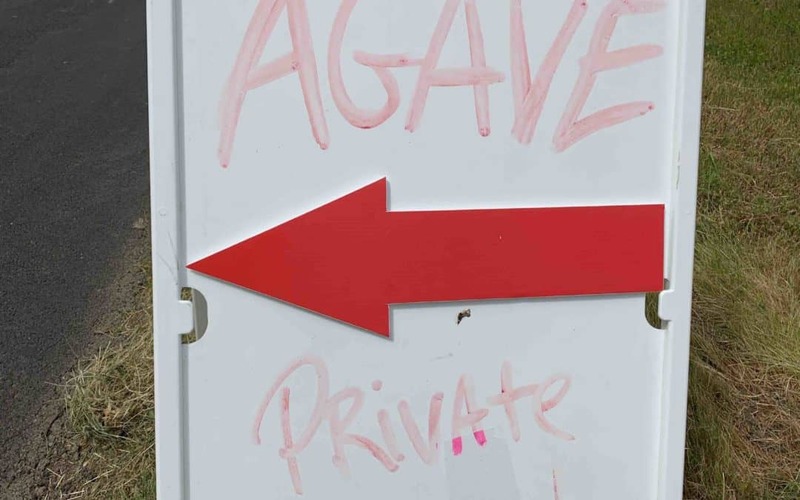 Why agave spirits? Why California? Why now? The easiest answer is that it’s easy and makes complete sense. As anyone who lives in California knows, agave grows virtually everywhere. It’s counted on as a hardy plant for medians and drought resistant landscape design everywhere. And, aficionados love growing all sorts of agaves for their own pleasure. So, it clearly has agricultural potential and given that it’s a plant that requires little if any irrigation it’s of great interest for a state perennially wracked by intense droughts. Doug Richardson is one example of the horticulturalists who have been working on this sort of project and he’s been at it for decades. He heads up Drylands Farming which specializes in agaves and a variety of other drought resistant plants. 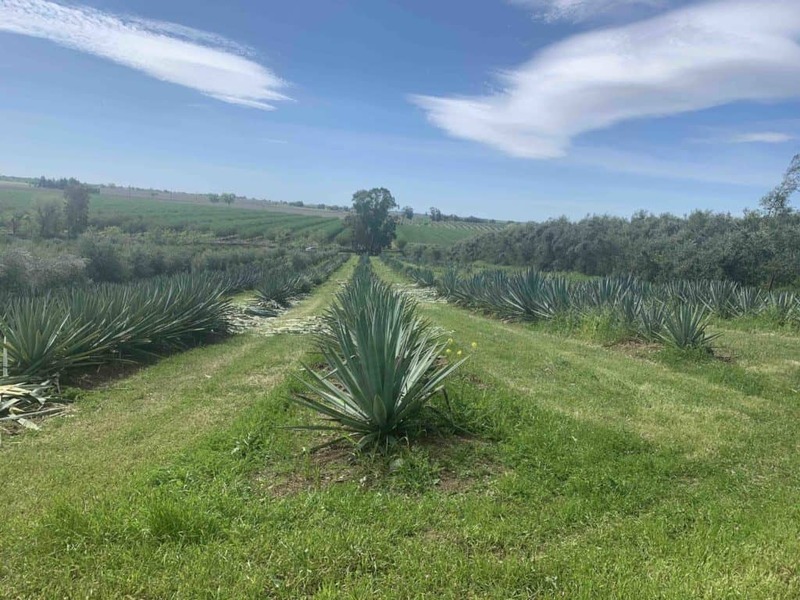 As we discussed how agave matches up well with California’s varied climates it was very clear that he’d already been hard at work on the problem – the issue is more a question of which agave for which environment rather than whether it can happen. 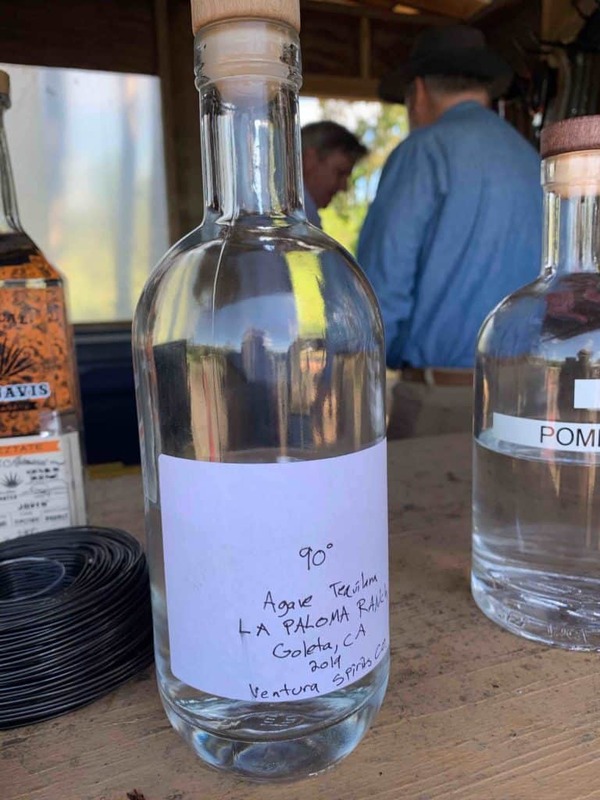 Earlier this year Doug collaborated with Ventura Spirits (perhaps best known as a distiller of Opuntia, a prickly pear spirit) when they harvested, processed, and distilled Ventura County blue agave. I tasted some of that at the roast Sunday – it’s clearly an artisanal tequila with rich sugars and hints of fruits. A bottle of Ventura Spirits’ agave distillate. Of course there’s also heritage. The State of California used to be the state of Alta California as part of Nueva España and later Mexico. Many Mexicans stayed here – as the saying goes, ‘the border moved, not me’ – and as we’re all very aware it’s a space of intersecting and overlapping, especially Mexican, cultures. Mezcal really is on the rise and California is one center of concentration for people obsessed with the horticulture, distilling, and larger cultural intersection. 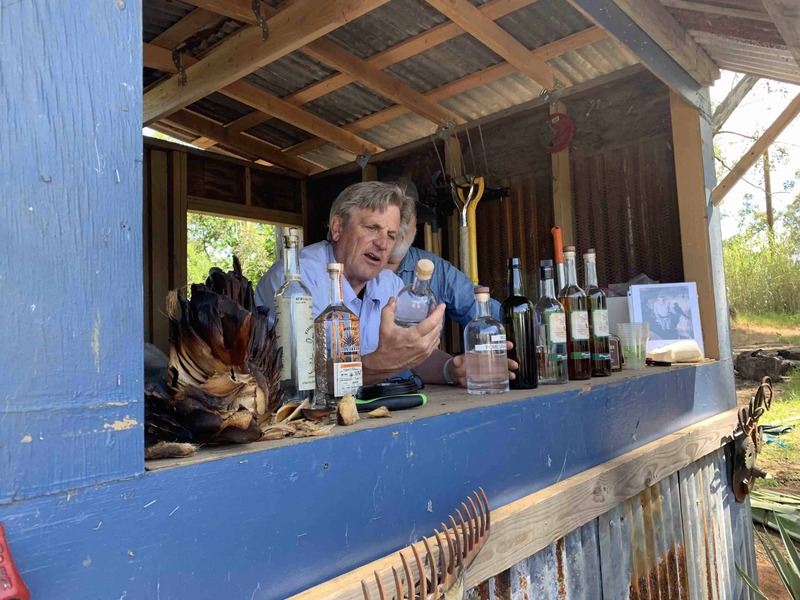 Craft distilling is blowing up at a rate that seems unsustainable economically but is clearly a testament to interest in consuming and creating craft spirits. It seems like all those people and the larger cultural forces have entered a vortex, the time clearly is now. After all, people are trying similar projects in South Africa, India, and possibly elsewhere. 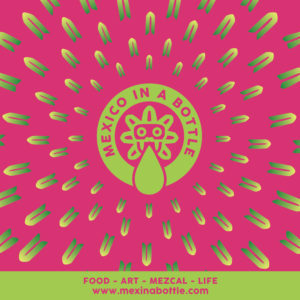 The agave plant is incredibly adaptable so the bigger questions are about sustainability, economics, and local tastes. Just look at wine (or whiskey, or rum, or gin) for examples that are closer to home. Efrain is a maestro mezcalero from San Juan del Rio who owns Benesin Mezcal and managed the roast. But back to this roast. Craig invited a variety of people out to witness the roast which went much faster than he’d anticipated. He invited Efrain Nolasco to manage the entire process because he’s a maestro mezcalero from San Juan del Rio who owns Benesin Mezcal. Efrain is so well versed in the process and happens to live much of the year here in Northern California so it was quite a fortuitous situation. Chris Pastena (left) from Calavera and many other Oakland restaurants discusses the roast with Lance Winters from St. George Spirits. In the roast that Craig did with Lance four years ago they used the same pit. This time around the agaves were harvested from the surrounding fields where Craig had planted hijuelos from the Riverside agaves in 2014. Raul “Repo” Chavez was the jimador who, like any of the professionals in the business, has amazing technique. Craig calls these agaves “dreamers” because they’re the children of that batch of agaves from southern California whose provenance in Mexico is unknown. Just like Dos Volcanes and the previous collaboration with Lance, these were from Tequiliana weber azul plants. This harvest they pulled 70 ripe piñas from the plantation, averaging about 85 pounds per piña for about 3 tons. There were plenty of local adaptations. Efrain used a two inch steel pipe to monitor heat and to add water for more steam. The oven is lined with dense rock from Mt. 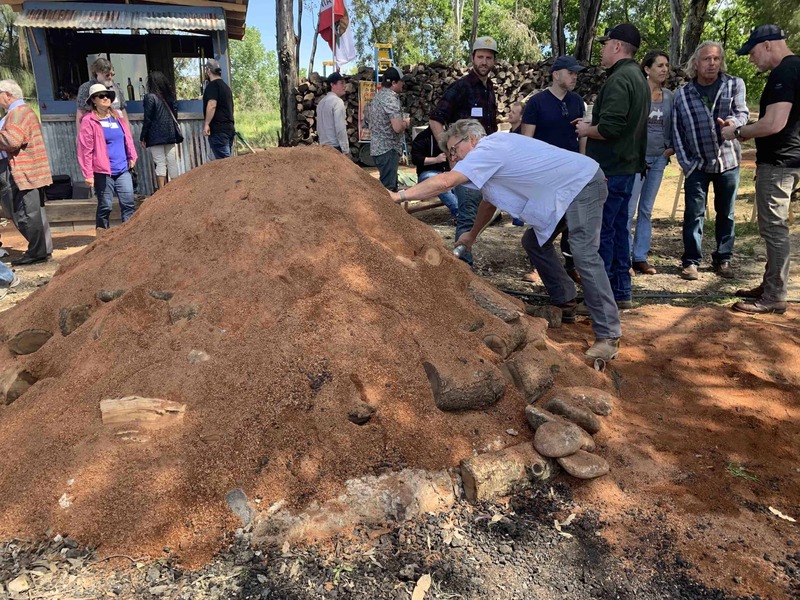 Lassen fire mortared together and covered with volcanic sand so it is a hybrid of Mexican know how and seed stock plus Californian materials – much like California itself. Craig Reynolds tests the heat of the roasting pit. 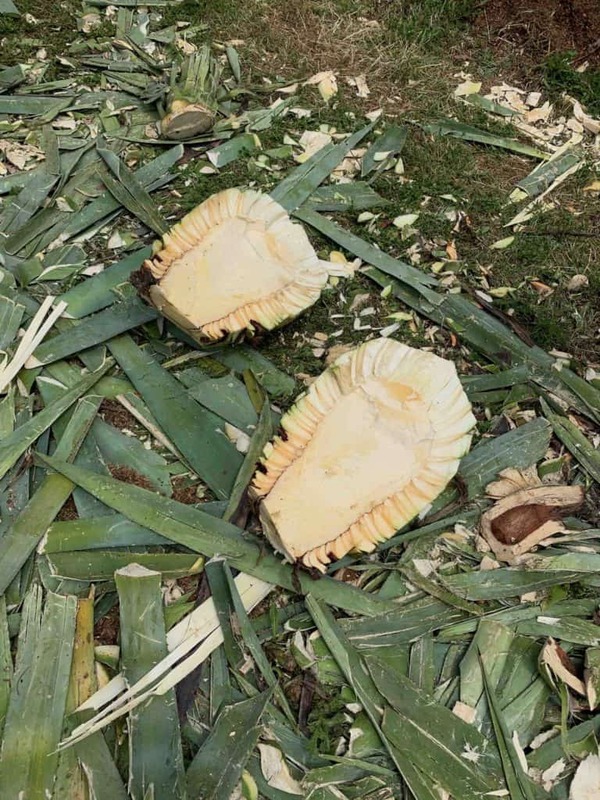 Lance’s plan is to run the roasted piñas through a two step crush; first through a knife shredder, then a sugar cane mill. Then they’ll be fermented with an inoculated yeast and, ultimately, distilled at the St. George facility in Alameda. We’ll report back on that process and the outcome as soon as it’s ready. It really was a delightful afternoon full of the things that defines our little traveling society of mezcal aficionados. Obviously some great drinks and great tacos from Woodland’s Savory Cafe and Tacos Brisas. 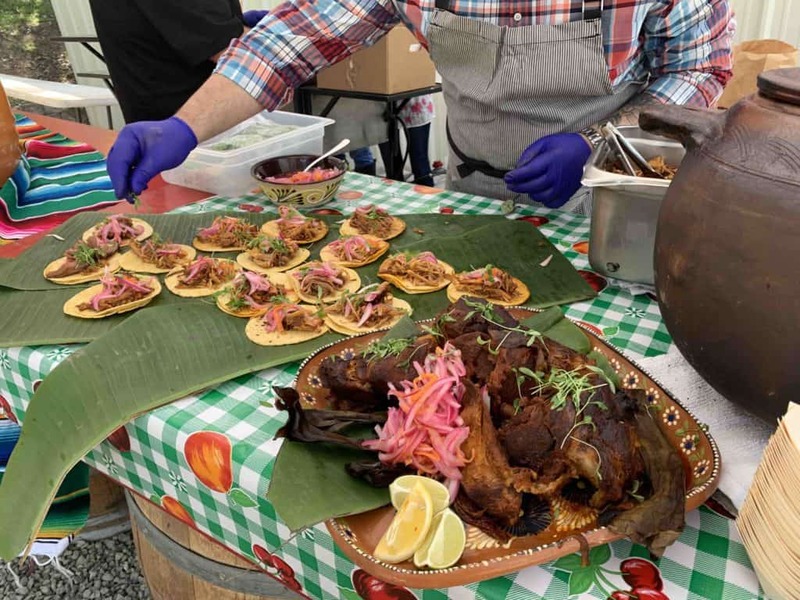 Their pibil was roasted underground on the property overnight and was full of nuanced flavor. The crowd was full of fantastic people from all parts of the world that makes mezcal possible. Clayton Szczech even made the trip up from Tequila specially for this roast. 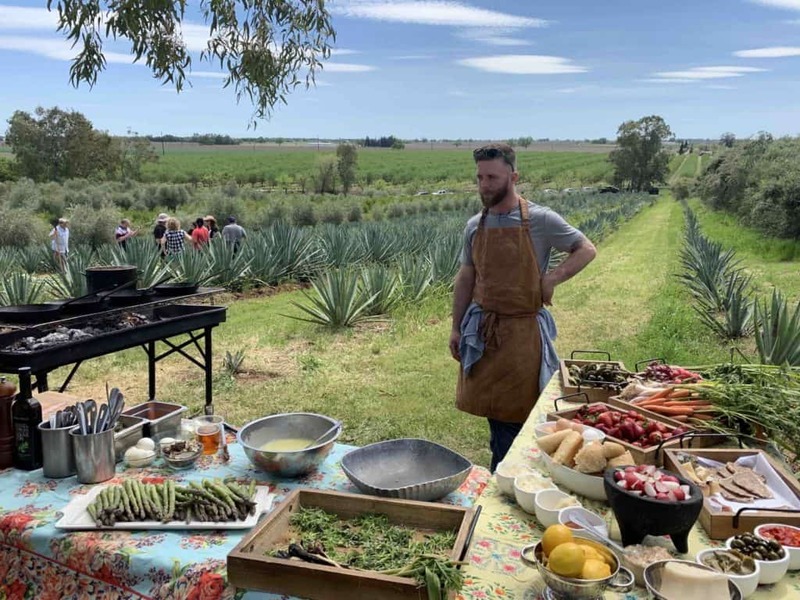 We had our very own California lifestyle moment as a film crew from Quantas shot an ad featuring Chef Patrick Mulvaney from Mulvaney’s, a prominent leader of Sacramento’s farm to fork/glass scene, as he cooked in front of the agave field. Bienvenido al nuevo Alta California! Chef Bryce Matlock from Mulvaney’s a prominent leader of Sacramento’s farm to fork/glass scene cooks in front of an agave field. There are so many strands that intersected at this roast that we’ll be pulling them apart for weeks and years to come. Obviously the question of agave in California is of prime importance and especially whether it can be an agriculturally as well as economically sustainable. 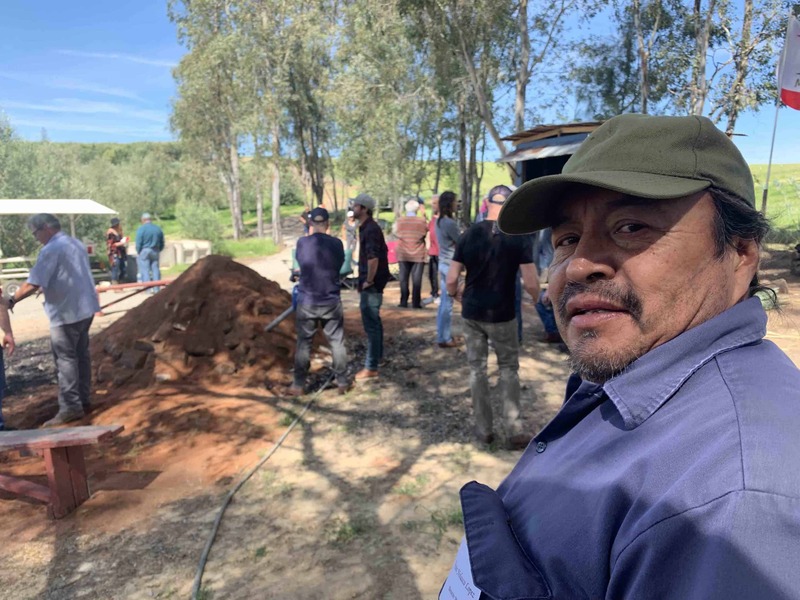 I’ll be very interested to follow up with Efrain Nolasco and hear how he describes this scene to his crew in San Juan del Rio when he returns there in May to work on the next roast for Benesin. 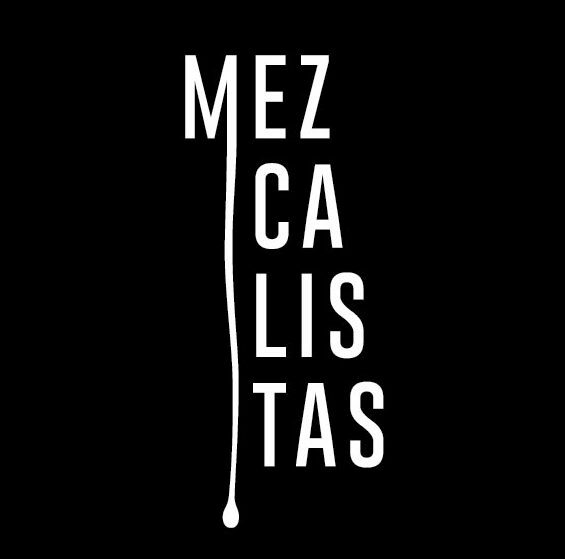 He has quite literally worked his way up the ladder to achieve his own little piece of the American dream by working construction to building a mezcal brand so his perspective is critical. And then there’s the question of doing this right. 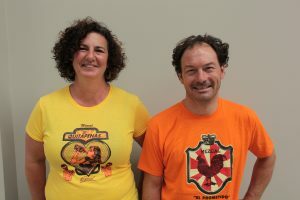 I’ve had a lot of conversations with people involved in this project and they’re all focused on how to create a legal and public policy framework for agave cultivation and distillation in California that will regulate quality and identity, to carve out Agave CA or whatever they call it as something distinct that reflects the distinctive cultural and environmental forces here. It won’t be easy but they’re definitely having the conversation now.